If there’s one thing that most fans of Japanese culture can’t seem to get enough of these days, it’s “Moe” brand anime. You know, the kind of anime usually filled with cute characters with cute personalities, attempting to live through life doing cute things … and whatnot. However, there’s one thing that fans of Japanese culture love more than moe anime: Mechas of all shapes and sizes. Occasionally, these two themes would get mashed together, allowing for adorable characters to run around in a world where robotic death and destruction is constantly occurring around them. 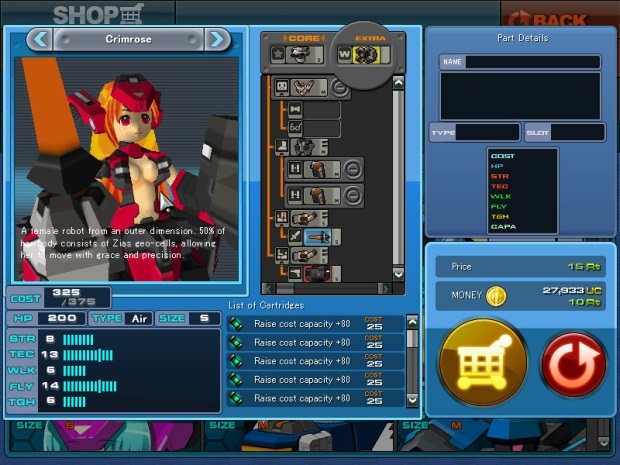 CyberStep originally released their own Moe Mecha MOTPS in 2010 called “CosmicBreak”, which featured faction-based PvP, tons of unique robots with customizable parts to mix and match, and a handful of cooperative game modes to keep players busy. While it all sounds like an anime lover’s delight, CosmicBreak is a game that packs a lot of excitement into a small package, but with the current player-base at an all-time low, sharing that excitement with others may be the real challenge that CosmicBreak provides. First off: When new players begin their first venture into the world of Cosmic Break, they’ll have to choose between one of three unions: Baldine, Wizdom and Dostrex, with each union representing Courage, Wisdom and Power respectively. Unions allow players to take part in various faction battles where up to 30 vs. 30 players compete to earn weekly rewards. While a three-way system is usually a good way to keep competition balanced, the game offers no incentive for players to join weaker unions. At the time of this review, Baldine has the most active and “skilled” players around, so many new players will end up gravitating towards the biggest union simply because of their numbers. Strangely enough, participation of union battles are not mandatory and earning rewards from weekly faction battles are usually meager progress boosters, such as 30% EXP boosters or 30% UC (in-game currency) boosters, so even with all the fuss made over deciding which union to join, chances are that players will not feel any real sense of “faction pride” like in other online games that feature similar PvP-focused gameplay. Getting a hang of the controls may be tricky for newcomers. 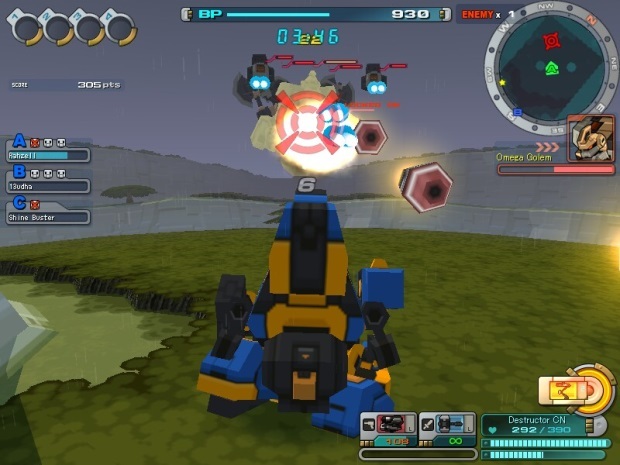 While CosmicBreak uses a familiar WASD control scheme, players must lock onto their enemies by keeping their crosshair as close to an enemy at all times before their attacks can cause damage. While it seems simple enough, throw in elements such as ground dashing, air weaving, power ups that can disorient movement controls and boost management, and you have a control scheme that’s easy to learn, but difficult to master. Battles in Cosmic Break are incredibly fast paced and frantic. Knowing your mech and cooperating with your teammates will constantly be an important factor to achieving victory. With three different mech sizes and four different mech types including Land, Air, Artillery and Support, there’s many different ways for teams to approach enemies, along with many different ways to take enemies down. There’s also a Rock-Paper-Scissors meta-game where Land beats Artillery, Artillery beats Air and Air beats Land. Of course, in the middle of a heated battle, even the most cleaver strategies can fall due the game’s incredibly fast pacing, but it creates a hectic, but fun sensation that not many F2P titles can achieve. 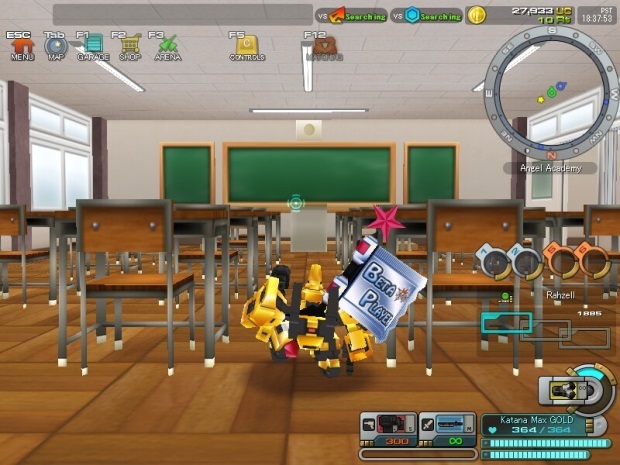 For those that aren’t into competition, the game also features a mission mode where players can team up with up to four other members to tackle missions against bots. These missions do a decent job of offering a challenge to players, especially at higher difficulty settings, but they pale in comparison to kind of action found in multiplayer competition, so this mode will be seen more as a training session for arena matches. There’s also a quest mode where players can venture out into the world and explore either solo or with friends, just like in mission mode. Players can find ancient treasures and special parts to customize their mechs with, but sadly, with some of the changes made to the game, playing through arena matches can yield the same rewards as venturing out in quest mode, so once again, it’s all just a lackluster alternative to PvP. Customization has always been a big part of CyberStep’s titles, and Cosmic Break is no exception. Player can customize their mechs in a ton of different ways, including different parts, passive abilities and more. You can also visually customize your mech using different color palette options and there’s even a small degree of model editing. No two mechs in this game will ever be the same. One important factor with customization is that each part equipped to your mech has capacity costs. In arena matches, the objective for winning is to exhaust your opponent’s battle points. Each time a mech is destroyed in battle, a deduction of battle points is determined by the each mech’s capacity costs, so mechs with high capacity costs will lose more points compared to mechs with low capacity. It’s a simplistic system, but one that gives players a tactical sense of risk vs. reward. While the visuals may technically be outdated, the low polygons count actual helps to give CosmicBreak a retro style, sort of like a late generation PlayStation 1 or an early generation Nintendo 64 game. It’s just too bad that CyberStep did not bother to update the game’s textures or increase the resolution size any higher than 800×600, so the visuals will not look pretty on high resolution monitors. Recently, they’ve introduced (and re-introduced) humanoid characters, each with their own personalities and storylines. Along with that, they’ve included a new rest area called “Angel Academy” where you can send your characters and mechs off to a weird robo prep school. Now players can truly live out their moe mecha fantasies. 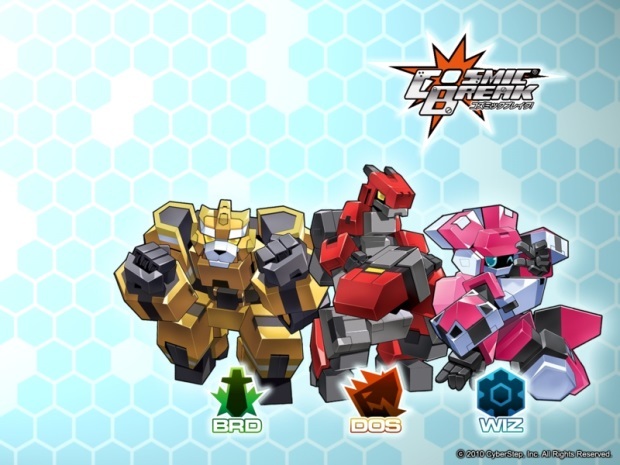 However, since the new humanoid characters and mechs have much higher polygon counts than many of the original mechs available, they seem strangely out of place, and overall they throw off the whole retro charm the game has. CosmicBreak also has this rolling world effect where mechs are walking in place while pushing the world underneath them. It’s a neat effect, but one that can also be disorienting at times, making it difficult to find your way around the environment. The original soundtrack handled by CyberStep is also a key element to the game’s presentation, with drum & bass, techno and electronica tunes available to help keep the energy and excitement levels high during gameplay. The current player-base for CosmicBreak is very low, so finding other players to participate in content other than arena shuffle matches will be difficult at times. While most of the active players only seem to be interested in arena mode, it’s not too surprising since most rewards that can be earned from every other game mode can be earned from arena mode as well. Sometimes, it can be difficult to even get shuffle matches going which are comprised of various participants from each union, and when there are just enough players to start a match, it’s usually a small amount. Sadly, any newcomers will perhaps never be able to experience the game’s hectic 30 vs. 30 union wars, which is when the game truly shines. 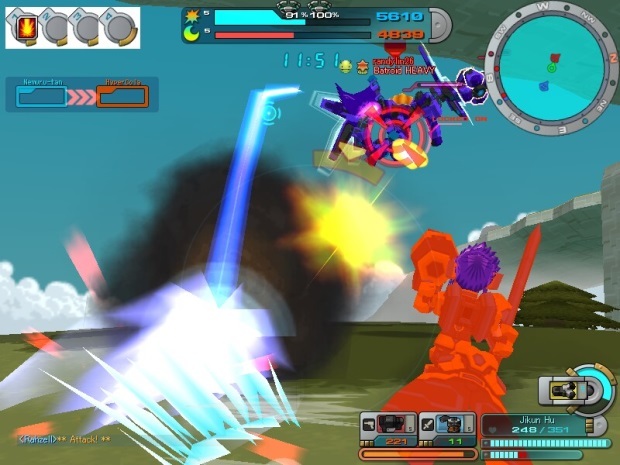 The game also features friend lists and player rankings , but with barely anyone playing, finding friends can be a challenge and plowing your way to the top of the leaderboards will come with fleeted glory, and that’s only if those players can stand a chance against others that have undoubtedly obtained a handful of “Garapon” mechs to compete with. Speaking of which: Garapon (which is basically a fancy name for “Gachapon”, I.E: Virtual Vending Machines) contain special mechs and humanoid characters that can be eminently power when properly leveled up and tweaked. The difference in strength between garapon mechs and regular mechs can be so overpowering at times, the Rock-Paper-Scissors meta-game would be completely thrown out the window. With such gameplay balance all caused by these mechs, many players have left the game in droves. 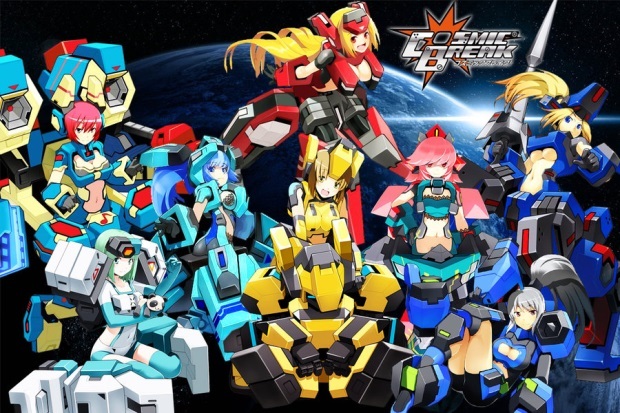 CosmicBreak is an MOTPS that has a unique style like no other, enjoyable gameplay that anyone can pick up and play and cute humanoids for anime fans to gawk over, but with a low player-base and overpowered mechs, new players may not be willing to stick around for long. Preview: CosmicBreak – Mechanized Penguins Must Die!